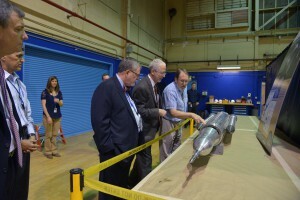 The heat shield for Orion completed its trek from NASA’s Kennedy Space Center in Florida to the agency’s Marshall Space Flight Center in Huntsville, Alabama, where engineers from both Marshall and the agency’s Ames Research Center in California are collecting samples of the ablative material on the heat shield, called Avcoat. The samples w ill be used by engineers to examine the char layers and degree of erosion, and along with other data, will be analyzed to determine whether any improvements need to be made to the heat shield before Orion begins carrying astronauts to deep space destinations. The heat shield was sent to Marshall because it has machinery and fixtures that can accommodate the 13-foot diameter heat shield. NASA’s Space Launch System (SLS) rocket is managed at Marshall, so the North Alabama team is accustomed to working with large structures. Meanwhile, Orion program managers from both NASA and Lockheed Martin continued their visits to American companies which contributed elements to Orion. The second week of March took them to Washington state and to Utah. Systima Technologies of Kirkland, Washington performed work on Orion’s forward bay cover, which protected the top portion of the crew module during launch, flight and re-entry. General Dynamics OTS provided mortar systems for Orion’s parachutes. Janicki Industries in Hamilton, Washington worked on the diaphragm for Orion’s stage adapter, which was used to keep rocket gases away from the spacecraft, while Aerojet Rocketdyne personnel in Redmond, Washington provided propulsion for Orion. Several members of the Orion leadership team also visited Orbital ATK’s test facilities in Promontory, Utah, where the company performed a major qualification test for the booster that will propel NASA’s Space Launch System, with Orion atop it, to space. The company also built Orion’s Launch Abort System. 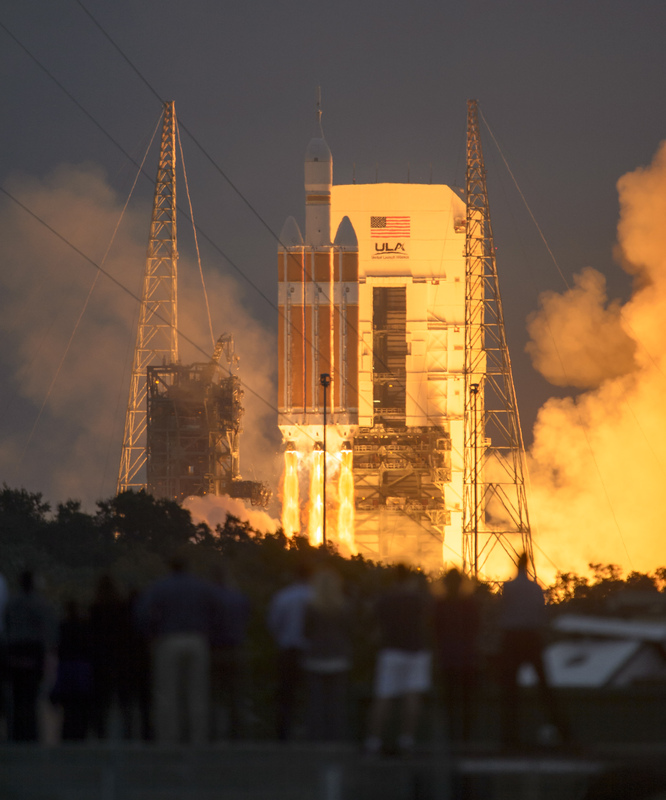 During the week of March 16, managers will continue their visits to major Orion contributors, visiting NASA’s Michoud Assembly Facility in New Orleans, Marshall, United Launch Alliance in Decatur, Alabama and NASA’s Langley Research Center in Hampton, Virginia. After Orion’s successful flight test in December, NASA and Lockheed Martin program managers who oversaw the design, development and test of the spacecraft are on the move to thank employees across the country who contributed hardware, testing and other elements for Orion’s maiden voyage to space. More than 1,000 companies contributed parts for the spacecraft, showcasing American ingenuity and manufacturing capabilities. In March, Orion’s lead ership team will travel to several places in California, Washington, Utah, Alabama and Maryland, to name just a few states they’ll visit, to meet the people who invested time and energy into the countless elements that had to work for the flight to be successful. On March 2, the Orion managers thanked employees at NASA’s Ames Research Center at Moffett Field, California. Teams there used the center’s Arc Jet facility to simulate the heating and air flow conditions that occurred on Orion during atmospheric reentry. Ames also developed a group of sensors on the heat shield and performed wind tunnel testing. Later this week, at NASA’s Jet Propulsion Laboratory in Pasadena, California, the Orion leadership team will thank engineers who contributed to testing of the spacecraft’s Thermal Protection System and drogue parachutes. Managers also will pay a visit to Aerojet Rocketdyne in Sacramento, and to Lockheed Martin’s Sunnyvale facility. Aerojet Rocketdyne propulsion played a critical role during Orion’s flight test, and the protective fairings surrounding Orion’s service module were tested in Sunnyvale. Engineers across the country have been busy taking a closer look at Orion and the data it produced during its successful flight test in December. At NASA’s Ken nedy Space Center in Florida, technicians removed the spacecraft’s back shell and heat shield, which protected Orion as it reentered Earth’s atmosphere at searing temperatures. Removing the back shell allows the team to get a closer look at Orion’s systems to see how they fared during the trip to space. 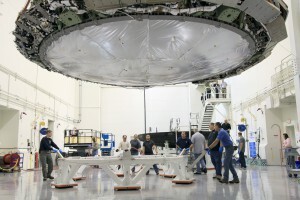 The heat shield was removed in preparation for shipment to NASA’s Marshall Space Flight Center in Huntsville, Alabama, where special equipment will be used to remove its ablative material. From there, the heat shield will be shipped to NASA’s Langley Research Center in Hampton, Virginia, where it will be outfitted on a test article for water impact testing. 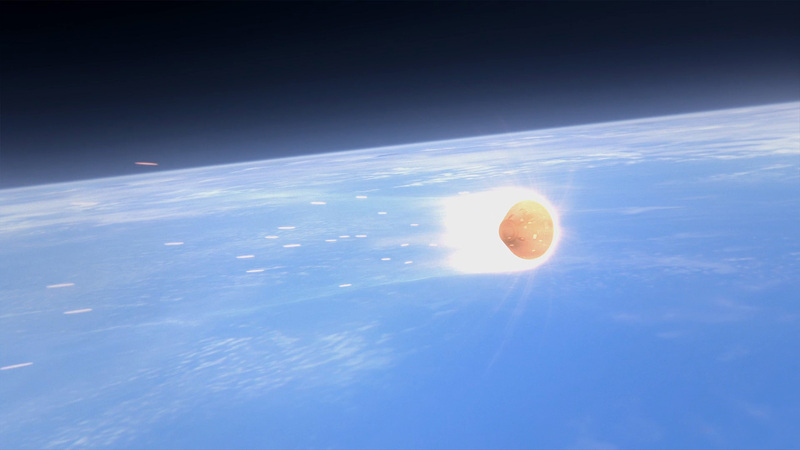 Meanwhile, NASA and Lockheed Martin, the prime contractor for Orion, continue to take a look at the data the flight test produced to validate pre-flight models and improve the spacecraft’s design. 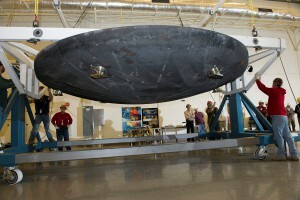 A 90-day report examining the flight will be delivered to NASA by Lockheed Martin in early March. Orion continues to slow down quickly as the atmosphere it flies through gets thicker and thicker. 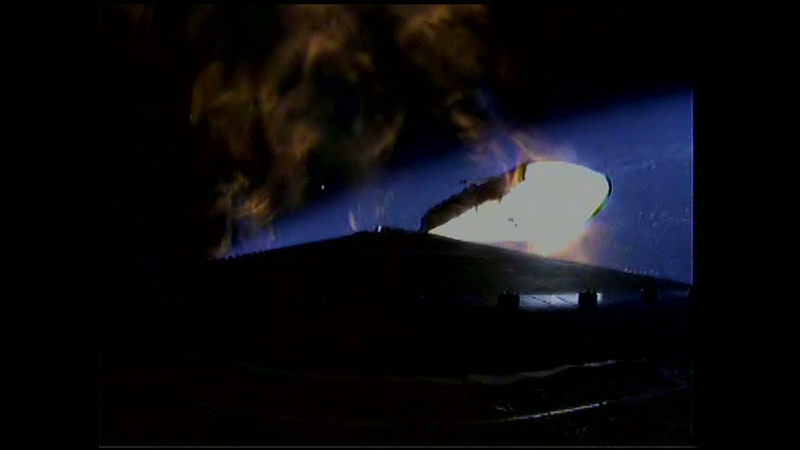 The thickening air also generates more heat and the spacecraft is now passing through that hottest part of reentry. 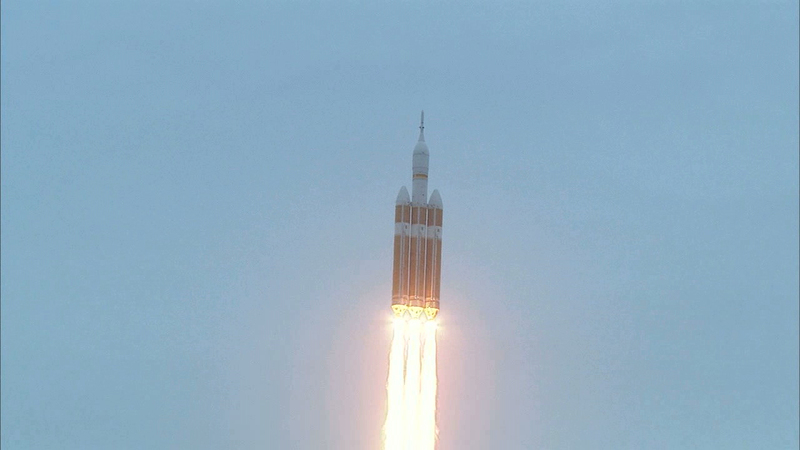 A look from onboard the Delta IV as the boosters separated early in the ascent. The white tower and fairing over Orion fired its motors to pull away from Orion as planned. Operational missions carrying astronauts will use fully active versions of the LAS capable of firing quickly to pull the spacecraft and crew away from an emergency during ascent. 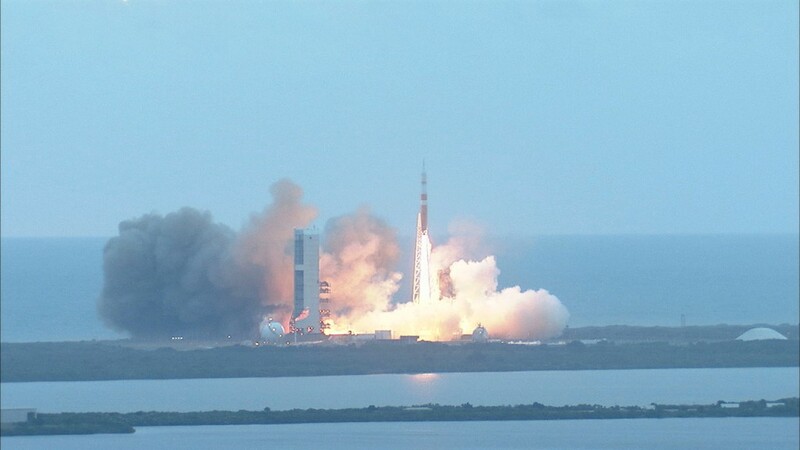 The Delta IV Heavy and Orion are supersonic and gaining speed and altitude as they zoom toward orbit. The Delta IV and Orion enter the area of maximum dynamic pressure – max q – when the aerodynamic forces of launch are at their greatest. All systems remain go.